As a reader, I almost always get sucked into novels and get very emotionally invested. But with Everneath, it was different. Nikki's emotions were my emotions, I felt everything she did, and when she was hurting, I was hurting just as badly. That's how strongly I felt about this book, and reading it was both extremely difficult and very exhilarating because of it. I wasn't just emotionally invested, it went so far beyond that! 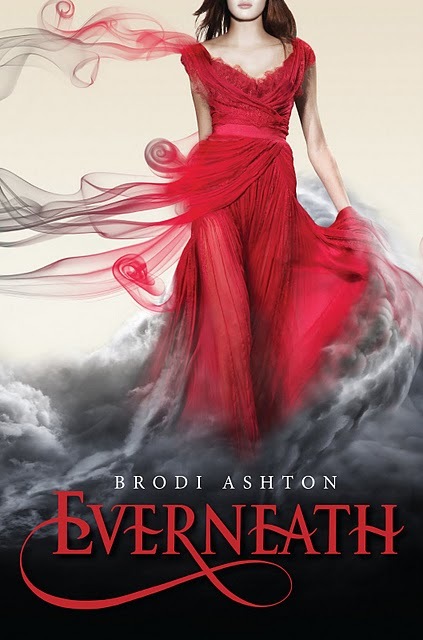 Suffice to say that Brodi Ashton has created a unique and wonderfully told novel in Everneath. I really have never read anything like it. I'd also like to say that I went in thinking it was a retelling of Hades and Persephone, but in reality it's not. If anything, it's a retelling of Orpheus and Eurydice more than anything. But there isn't one set mythology that Ashton draws from, she uses Greek and Egyptian throughout the novel, which I thought was really interesting as a mythology buff. She drew some parallels between the two mythologies that I hadn't thought of before, but now I'd really like to explore them. To say that I love both Jack and Cole is a huge understatement. I adore both of them for different reasons, and I'm really not on either team. Jack is just... wow. He's the perfect boy, because he never gave up on Nikki, ever, and that's something that literally saves her life several times. Cole is much more complicated, because of what he is, but I really love him as well, and I wouldn't mind if Nikki went with him either. Can you tell I loved this book? Because I did. I recommend you buy it right now at this very moment, because you'll love it too! So, so good. 5 out of 5 stars. Love this review! I wasn't sure this was for me but I'm keen to read this one now. Wow, what a great review... I cannot wait to read this one! well, now I am going to want to read this in that way that makes you all...angry and bitter. Thanks. Seriously though, WONDERFUL review. I loved the gifs, really helps keep the attention (as does your writing). I loved this book. Can't wait to see what happens next; it's not that I wasn't expecting that ending but still.. oh my..